Connect a VGA monitor to a video card with DVI-A output in tight spaces. Connect a VGA monitor to a video card with DVI output. 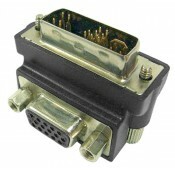 DVI-A male to 15-pin HD female connectors.